Note from Mark: You’re on board with the challenge, but what should you eat? No worries. The Worker Bees and I have you covered. Every Saturday and Sunday during the 30-day challenge we’ll be bringing you some delicious Primal recipes. (Sorry, no Weekend Link Love for the next few weeks!) Enjoy! There are certain foods that people have very strong opinions about. Often, these opinions are regionally based. If you’ve ever been stuck in the middle of an argument about New York vs Chicago pizza, you know how heated the debate can get. Crab cakes also elicit a strong emotional response. Some cooks swear by Old Bay Seasoning, others use paprika. Some cooks add red pepper, others think it’s sacrilegious to use anything more than diced celery. But across the board, one ingredient seems to remains the same: breadcrumbs. You have to add breadcrumbs to crab cakes to bind them together. Or do you? Questioning these sort of food fallacies is a common practice for modern day Groks. Yes, breadcrumbs hold crab cakes together, but the main reason they’re in crab cakes is to act as filler, so restaurants don’t have to put as much crab in your cake. Making a perfectly delicious crab cake bound together solely by egg yolks is easy to do. First, let’s talk about fresh crab. You can buy whole crabs, but already picked meat is both easier and usually not much more expensive. Some stores also sell packaged wild-caught crab meat that is pasteurized and refrigerated and slightly less expensive. (this is much different than imitation crab, which should be avoided at all costs). 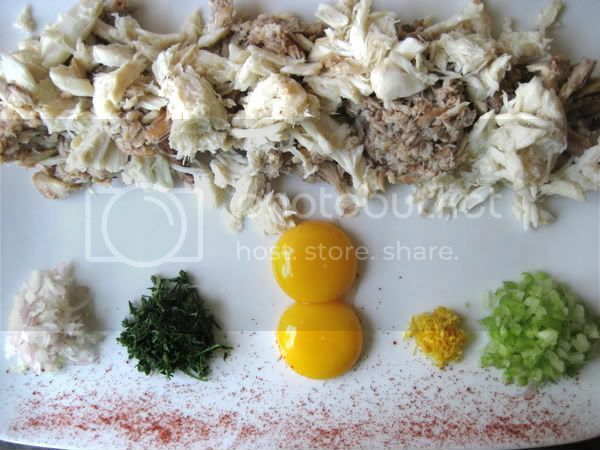 For crab cakes, Dungeness Crab is the most sustainable choice and Blue Crab is a good alternative. 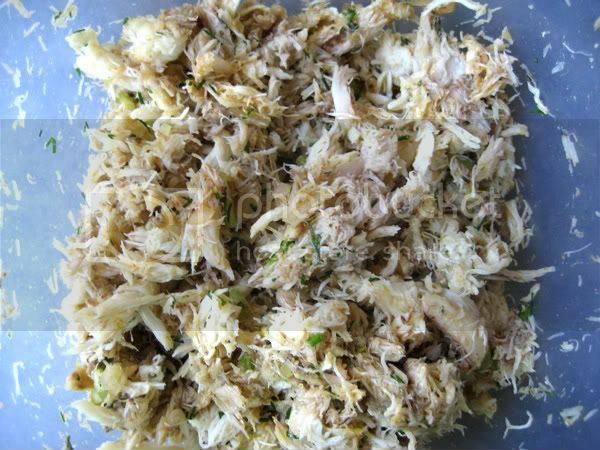 Lump meat is the bigger chunks from the body of the crab, often lighter in color with a richer texture. It’s considered the premium part of the crab and you’ll pay premium prices for it. Claw meat has more of a shredded texture – it’s less pretty, but can also be more flavorful (and it often sells for half the price of lump meat.) 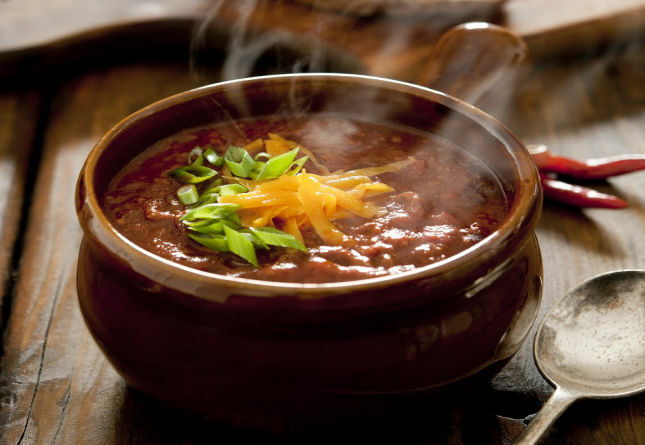 This recipe uses a combination of the two, for texture and flavor. 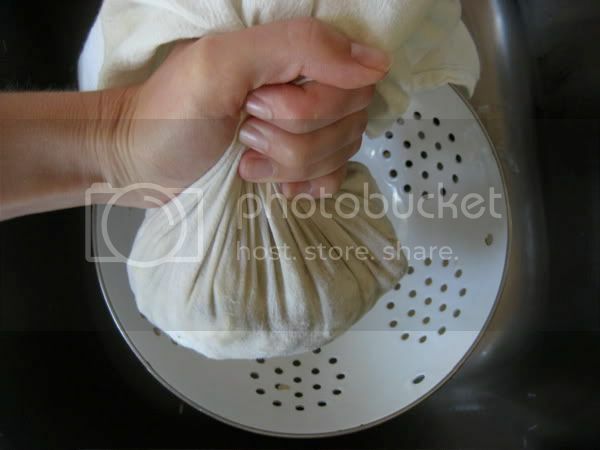 Bundle the crab in a thin dishtowel and give it a few hard squeezes to release moisture. You’ll probably be able to get a couple tablespoons of liquid to drip out. Whisk the egg yolks. Add the shallot, celery, dill, lemon zest, hot sauce and paprika. Gently mix this into the crab. The mixture is not going to look like it will hold together, but don’t worry. To form the crab cakes all you need is a round cookie cutter about 2 inches wide. Using a tablespoon measurement, scoop 2 generous tablespoons of crab into the cookie cutter. Preheat your oven to 375. On the stovetop, heat the olive oil in a pan. When the oil starts to sizzle, use a spatula to slide the crab cakes into the pan. Cook about 2-3 minutes on each side until they are browned and crispy. Don’t put too many in the pan at once. Use a spatula to scoop the cakes out the pan and onto a cookie sheet. Put in the oven for another six minutes to make sure they are warmed through the middle. Garnish with dill. The most important steps in this recipe are using the cookie cutter to shape the crab cakes and refrigerating them for at least an hour before cooking. Other than that, let your regional tastes take over. Add red pepper if you like or mustard. Play around with the seasonings. But forget all about the breadcrumbs. You won’t even miss them. Looks like right now that shirt is MINE. I had chicken on the grill in mind for dinner. This changes EVERYTHING. Thanks Mark! being in maryland im well aware of the argument u speak of. this will blow some peoples mind. cant wait to try it. thanks. Hey Mark, I think you should definitely do a Primal Recipes Book. I’m pretty basic and usually don’t get beyond grilling or frying some meat with veggies and the sort, but all this encourages me to actually get creative and think (one of the rules right? use the brain!) and realize that there is much more variety of flavors and food choices when cooking Primal stuff rather than the old rice/pasta plus what-have-you that is styled so much in Europe. Grok on and keep the good work! I have to eat in a military chow hall. I don’t think that I can get those ingredients in the salad line. I will live vicariously through you all. Those look incredibly delicious, even at 10:30 am. I’m a Maryland native as well. I have never used breadcrumbs in mine, but Old Bay is a must in this part of the country. No celery. Mustard is a plus, even a little mayo. And Blue Crab. The egg holds everything together nicely. And, finally, fried not broiled is my favorite. Not sure why so many restaurants insist on broiling the things these days – probably the whole low fat mentality. These make me hungry just looking at them and I just made crabcakes this week! Might just have to try these out! I agree with Covo, a Primal Recipe Book would be great. Im a CrossFit Trainer and Im always trying to get my clients to go Primal, but among the myriad of excuses, not knowing what to cook is one of the more common ones. A recipe book would be an easy way to nix that excuse. Mmmmm….I love crabcakes. Possibly one of the few meals I would use as my “cheat”. Now it looks like I don’t have to! 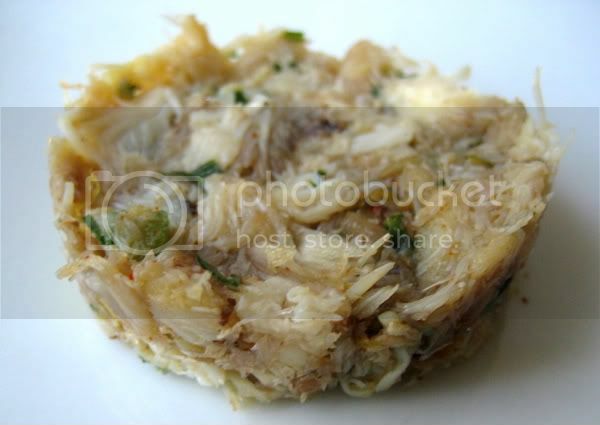 Here in the Northwest with Dungeness crabs so abundant, this will be a great recipe to have on hand, especially if I’m able to go out and trap the crabs myself. Crab cakes are one of my favorite things. Always had to try them at any restaurant that served them. Will definitely try this recipe. Another favorite is minastrone soup. any primal recipe for that? Looks scary, I’ve never eaten crab in my life (I’d try though)! I make similar cakes with canned tuna. Works when you cant get the fresh stuff. Canned salmon works well too. i’ve never been a big seafood fan, but this post made me hungry for some! looks really good. More crab…less bread…sounds better than the standard crab cakes I’ve grown to love! WOW… that is some serious food art for the ingredients picture. Very nice! Ohhh…. now I am really hungry. I don’t think these would make an appealing breakfast though. Hmmm, maybe lunch! this will be perfect.I just found an asian market that has live blue crab. I grew up in Baltimore and I love crab cakes. 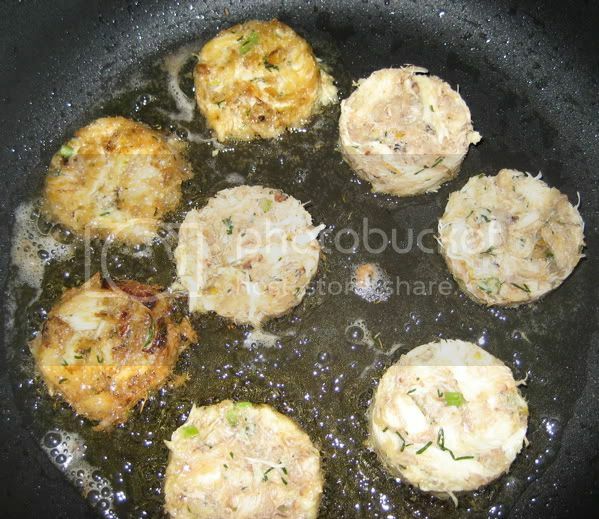 Recently,I have made similar crab cakes without the breadcrumbs and it works great. I agree with Ibd – Old Bay is a must. Mouth watering photos! This looks like a perfect summertime dish. I look forward to seeing more, and trying them too! not a huge fan of crab meat… but i’ll give it a shot. These look yummy! I’ll definitely be using this recipe to get rid of a lot of the canned crab meat that’s been sitting in my pantry!! Man those look tasty. I’ve never tried crab cakes (too much planning required – me lazy! ), but I might have to try it out! Dear Lord that looks delicious. I think I shall try that tomorrow. mmmm…. I’ll take mine with dungeness! What’s the easiest way to separate the egg yolks from the whites? I wonder what kind of crab fisherman Grok was? looks good! I love finding ways to make “old favorites” healthier! Those look amazing! Going to have to try it out. Yum! I love finding new healthier ways of making old favorites! Ooooh, this sounds awesome. I’mma have to see if I can get ahold of some crabs, maybe around my birthday. I’m allergic to crabs so I should get a t-shirt instead! I will be very crabby if I don’t win that shirt. Hmm if only I could eat crab!! Might give this a go with tuna. Roger: if you want to get the yolk on its own just pass it between the two “cups” of shell to drain the white off. Not a big fan of Crab cakes, but I will definitely have to try these at some point. Mark, I love crab cakes but have stayed away since Feb…tonight we will be reacquainted. OMG, these look fantastic. I will definitely be giving this recipe a try. Thanks, Mark and Worker Bees, for giving us new recipes to keep us happy and PRIMAL. I REALLY want a “Grok On!” T-Shirt. Also, the crab cakes look great. The wife and I are going to try them out. This looks great. I’d suggest pairing this with Primal remoulade sauce. 1/2 cup of olive oil mayonnaise, 1/2 tsp of dry mustard, 1/4 teaspoon of old bay, and a teaspoon of fresh garlic. Grok on! Those crab cakes look soo good, i want to try immediately! Perfect timing, as I am on my way to the farmers market this morning, and there is usually someone selling crab there. Can’t wait to try this recipe. The crab looks amazing, especially after deadlifts in the AM! Any Primal recipe/substitute for malt vineger? I’ve always been amazed that people will pay outrageous amounts of money for crab cakes that have way more breading than crab. A more honest name would be “crab flavored bread cakes”. The hardest part of this recipe will be finding a round cookie cutter in my kitchen. I have some shaped like witch hats, bats, and dog bones, but I don’t think I have a plain old circle. Make my shirt black, size small. Wow, this looks really great…can’t wait to try it! Never made crab cakes before.. i definatly have to try these! Crab Cakes! Love em. Aren’t they the ocean’s Roomba? mmmmmmm…. crab cakes. I could eat these every meal of every day and it would never get old. I don’t like crab cakes but I love this shirt!! Cool, I’m gunna try this with some of the canned salmon I got sitting in the pantry. I’ve also used flax meal as bread crumbs before. I’m sure coconut flour or almond meal would work decently as well. Tried these with canned salmon and 1T of coconut flour and 1 egg as binder….along with some onion, hotsauce, cilantro and lime juice. It was really good over mixed greens. Not bad for a thrown together meal! Looks really good. Surprised they would be good without the bread crumbs, but will give them a try. This is a recipe I could do. I can only figure out simple things like this… looks good too. I really appreciate all the recipes and other food advice you offer on this site. Looks great, and something even the kitchen-challenged can handle. Crab cakes are downright comfort food for my non-primal spouse. Hmmm… a light bulb is flashing here! I have never actually tried a crab cake. Maybe it’s time. help, i’m naked, send me a shirt!!! Now that’s my kind of “cake”! Thanks from a Baltimore native! Ok, you forced my hand…I’m getting some crab and making these. That looks great! I haven’t eaten crab in so long. I’m going to try this recipe. Those look great! Cant wait to try them. No seafood for me, perhaps growing up landlocked ruined my taste for it, but I sure would like a grok t-shirt! I promise to post pictures of it in the wild. Yum! At my house we *love* crab cakes & now we can eat ’em guilt free!!! Man, I love crabcakes, so a primal version will definately be put on my To Make list!! These look so good! I love crabcakes and can never find any that aren’t mostly breadcrumbs. I also like the idea of making them with tuna or salmon. Delicious! I’ll make these tomorrow night — thanks for the suggestion, Mark. I don’t eat crab… but I’d LOVE a t-shirt! This is so much better than the food at lollapalooza! And definitely way more Primal. Grok love crab…Grok hate cake…Grok melts for crab cake! What great insight! Never thought to use a cookie cutter before. I kept trying to figure out how to keep them from becoming a big ball of mush. I knew the refrigeration helped everything adhere together but I still ended up with a soggy mashed-patty. I like to add some worcestershire sauce for some added kick. Not too much or the taste of the crab will suffer, but just enough to pack a punch. I can’t wait to try these. I hate breadcrumbs in crab cakes. It always seems like I’m being cheated. I don’t mind breadcrumbs in stuff like this as I considered them a necessary binder. Thanks for the binding techniques sans breadcrumbs- good advice for everything from meatloaf to salmon patties. I’m not usually a big fan of crab, but these truly look too good to pass up! That sounds great! That will be tonight’s dinner! Costco sells the pasteurized crab meet in a can – look for it in the refrigerated section near the deli meats. I’ve used it before in some recipes and can vouch that it’s pretty good stuff. Breadless crab cakes are awesome…let’s be honest you only eat crab cakes for the crab anyway, not the bread!!! This looks great! Why loose the egg whites though? I have used egg to hold ingredients together (often in place of breadcrumbs) but I’ve always used the whites…Is there a tip here, or just a preference? Thanks for the receipe in any case! I smell a PB cookbook Mark! since I can’t eat wheat, it’s always great to see recipes that don’t include it! it’s just one more reason to follow this great site. I am definitely going to be trying this one. Thanks Mark!!! mmmmmmmmmmmmmmmm crab cakes. Love em! awesome .. but am wondering where to get the crab meat in chicago! I am tempted to eat those..
Yummm…. I’ll be all about eating some of those. Now, just have to get to the store again. That and I want one of those shirts :). I will have to try these. My fiance and I were talking about crab cakes last night…weird! My New York born and raised wife uses Old Bay on her crab cakes. I’m going to make these and see what she thinks — sounds like a great recipe! Ive never had crab before, but these cakes look good! appreciate the notes on crab processing and sustainability. must have old bay! Going to try these with some mixed in. Looks like I need to add a few items to my grocery list. Maybe I’ll go shopping in my NEW t-shirt!? Looks delicious! Maybe I’ll try those soon. Crab cakes are one of my biggest weaknesses! It’s nice to see a Primal version. Going to make these this weekend! If I remember right, Art Devany was into imitation “krab” for awhile. Hmm, never seen crab meat anywhere. Have to keep my eyes open. Sounds nice. It to hot to do that much work for crab, easier to just steam me some legs outside and break them open and enjoy. Having to pick out the meat make you eat slower. WAHOO! Grok on with some crab cakes and t-shirts! I don’t do crab. I’ll skip these. I love crab and now I have a completly Primal way to make crab cakes! Crab is some of the most wonderfully flavored meat on the planet (especially the tiny slivers down in each leg). I’m going to try the recipe, but I’ll substitute lard (the king of cooking fats) for the olive oil. Lard is much better than olive oil at taking cooking heat without oxidizing (I do like olive oil on salads, however). Who needs bread in crab cakes anyway? I’m off to Trader Joe’s to get some lamb and, I hope, some real crab meat. My husband and I hope to make the dish tomorrow. Hmm… never been much for seafood, and never tried crab, but things can change. Those look good! I only recently started liking crab as an adult. Apparently I used to eat it all the time as a small child. This recipe looks lovely. I’ll keep an eye out for some good quality crab. My wife is from Louisiana, so she KNOWS crab cakes. We’ll have to give these a try and let you know what she thinks. I’m an XL working myself down to a L after these 30 days. just tried it! great taste! thanks for the idea! OMG, I have been DYING for salmon cakes. I’ve totally gotta tweak this recipe for salmon, maybe with a horseradish aioli! I’ll win them over yet! I love buying Crown Prince Fancy White Crab Meat to make my cakes! Is Canned Crab Meat ok? I think i remember seeing in a store cans of wild caught canned crab meat, and it wasn’t cheap. I just don’t want to buy something that’s not the real thing. I would say it is. It isn’t cheap you’re right. It is the real stuff though. I’m trying this as soon as I lay my hands on some good crab meat. Thanks for the awesome recipe! I would suggest some cream-based sauce flavored with dill to go with this. Awesome recipe! I’ll have to try it out soon. Garnishing will fresh dill is definitely the way to go. Looks so good, I’ve never cooked crab before, now might be the time to try! I now know what I’m making for dinner tonight. Great! I figured fish/crab cakes were out! I will try this but possibly add a little almond flour in the mix. Looks fabulous though! Great! More crab and none of that bread filling mixed in like some restaurants make theirs with. I grew up on crab cakes, and these look pretty good! That’s pretty crabby! I love crab cakes, but I have always eaten the kind with breading. I’ll have to try this! Adding stuff to grocery list … now! Ooooh la la! That’s what I adore about digesting Mark’s Daily Apple! Could sustained movement, leaving the breadcrumbs out of the crabcakes, hoisting a few sandbags, and sprinting down the beach really be the key to looking like a Greek Goddess? I’m convinced that you’ve found the secret. Thanks for sharing it! The crab I see when I’m hiking are pretty small. Barely appetizers. Thanks for the chance to win a shirt. These are the best looking crab cakes I’ve ever seen. Dang, I am on a IF today and those look fantastic! Now that’s a crabby patty! Looks good. I may make some tonight. I love crab cakes but have never tried to make them. 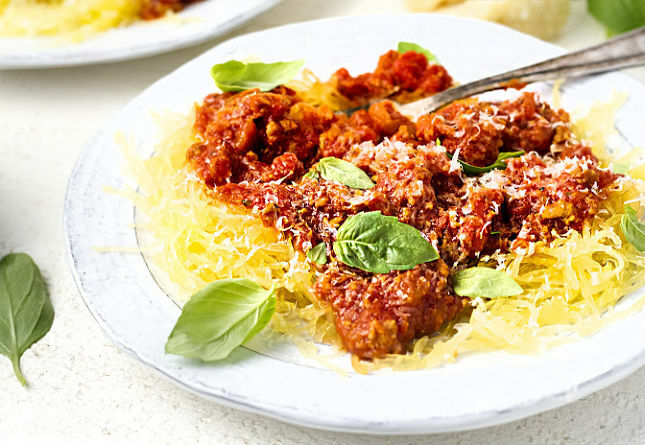 These look easy and scrumptious – will give it a go soon! I’m still so leery of anything involving seafood, but really I now live in an area (SF, CA) that has good fresh seafood readily available, so I have absolutely no excuse! I am working hard to make SF more a part of my diet so this is a helpful post. I never thought I’d like crab…until I actually tried it. Crab cakes are awesome, and it is good to know you can make them bread-less. Recipe looks delicious. I would love a tshirt. the most amazing thing, beside the great-sounding recipe, is the huge group of commenters.What a difference you are making with all your information! I’m workin’ hard on the recipe video. The Vibram shoes WILL BE MINE!!! Thanks for all the excellent food suggestions. I made the Carrot Walnut bread for dinner last night, and will be making Fennel and Dill Omlet for breakfast tomorrow. It sure makes going primal easy! I don’t eat crabs out of fear of the Crab people. I try to avoid crustaceans. But those crab cakes look AWESOME! Mmm…I have only had “bread-free” crab cakes a couple of other times at a pretty high dollar restaurant. So great to see a recipe that I can make at home! I neeeed to try making some of these crab cakes. I think I would enjoy these, I’m sure I have a tin of crab in the cupboard. I’m always on the lookout for something that’s simple and quick to make, this recipe fit’s the bill. I hope you do compile a recipe book, I would definitely buy it. Looks good! Is Old Bay Seasoning an East Coast thing? I still want a spear to go with my T-Shirt when I go hunting in the market. i use the almond flour instead of bread crumbs in crab/fish cakes, to make chicken fingers or schnitzel. If you have a trader joe’s in your area they have lump meat crab in the refrigerated section and like everything else in the store the price is great. I think it’s 8.99 for a 16 oz can IIRC. Don’t get the small cans that are not lump meat…they are usually full of shell bits. Wow, those look really good. I love crab. Those crab cakes look great. They may well be on the menu for next week. Yum! Thanks for such a well-laid out, comprehensive recipe. I’m gonna have to walk like a crab to the supermarket and get started on the lil’ fellas! I’m going to try these next week. Those crab cakes look delish. I’ll have to get around to making these sometime, they look quite delectable. Can’t say I care for crab cakes. That looks like an awesome shirt! I would love to have one of those and rep the Paleo lifestyle when I go to the gym or go to class. These look rad! Grok like!!! The black t-shirt would look great on my son’s new primal body so if I win it will be a gift to him. The crab cake goes into my recipe file. It looks yum-o. OMG! This recipe is Awesome! I swapped out the crab meat with some Bumble Bee Mackerel 1.82 per 15 oz can…the whole family LOVED IT! Sound great, I’ll have to try this! 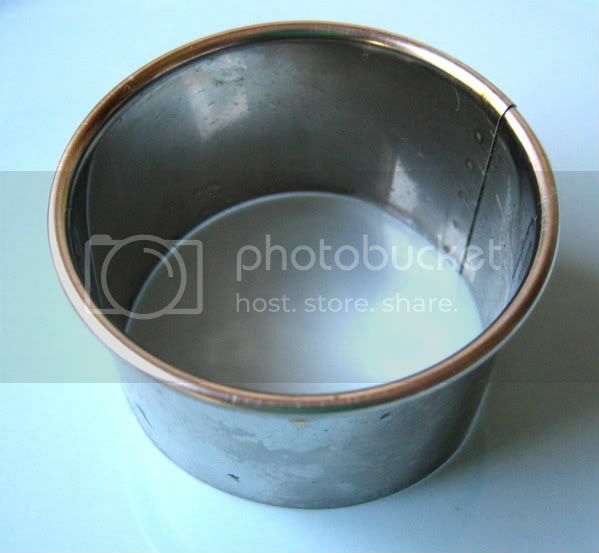 You can make a cookie cutter by taking the top and bottom off of a small can… Will be trying these soon! Love crab cakes! These look good. Ya know, it’s post like this that make it hard to swallow my grilled meat & veggie dinner every night. Who knew it could be that easy? Glad to read above that Costco has crab meat in a can – what little crab is available in desert grocery store meat counters is not appealing! Almost makes me wish I wasnt scared of seafood! Im definatley an inlander Grok! Just had Leftovers a la King tonight — a great primal recipe. I’ll take my t-shirt in L so I fit into it once I drop all my Korg weight! looks good but i just want one of those shirts LOL. These look great! Kinkead’s in DC has my favorite crab cakes… lots of lump meat and no bread filler. I never even liked crab cakes until I split one of those with a friend. I might just have to make me some! Looks great. trying to create a primal sauce for them. something with paprika and homemade mayo. I’m trying to convert an ovo-pesca-tarian to the primal blueprint. recipes like this really help. ps. the primal blueprint changed my life. Looks delicious! Hope I don’t spill any on my new shirt! I used to make Tuna Cakes like this, same principle. Before I went primal, We used to mix in cheese. Gone are those days, not that I miss them. Crabcakes are a personal favorite. There is one restaurant here that makes them without bread crumbs and they don’t seem to appreciably raise my blood sugar. Look forward to trying these. Thanks! My husband and I love crab cakes and I will definitely try these out! I was just pondering the salmon patties my mom made for us growing up and wanting to try my hand at making a more primal version. I think this will fit the bill nicely. These sound great! Can’t wait to try them out. Love crab cakes, Hate green pepper, why do they always put green -freakin’-pepper in them. These I have to try! Oh yum they look great, I’ve never cooked with crab, best it’s time I did. Would be great for the summer BBQ too! Not a big seafood fan….going to have to experiment with this recipe!! Hmm, if this is anything like the simple bacon and scallops recipe from a month or so ago, it will be DELICIOUS!! Looks tasty. Wonder if I can find any good fresh crab down here. Thanks for the recipe Mark, looks tasty! This Grok is Jewish – can’t do crab! Will try salmon. This is awesome!! I’m so going to try this. I will try this recipe tomorrow, substituting turkey as crab is not readily available here. Simple recipe with fresh ingredients are great! This Grok eats local…will try steak cakes! Darn… now I wish I had seen this before I went shopping… I need to try this recipe. Love crabcakes but never tried making my own. This recipe looks like the perfect excuse to give it a shot. Sweet–got my comment in right under the wire. Grok on! I wonder how that would taste with tuna…. That looks tasty! Unfortunately, every time I’ve eaten crab (twice), I felt like I’m going to die for the next several hours. Stupid allergies. MMmMMMmmm. I’ll probably use coconut or sesame oil though, as using olive for frying is above it’s smoking point. Any commenbts on this pleasum ? From the Weston A. Price website (http://www.westonaprice.org/traditional_diets/caveman_cuisine.html). There is much more than this, but this excerpt seems relevant to your arguments. Great job, Worker Bees! I love crab cakes. Oh… and I’m a hard-core Chicago style pizza eater…. any Primal substitution suggestions? Keep’em coming I’m going primal tomorrow! Never really been a big fan of crabs, either kind =), but maybe i should try this one. Fantastic – great simple explanation and photos. I just got home from Sea Trial with a Maersk rig, got home, ate clean oatmeal + peanutbutter + banana + raisins. Did a mini crossfit WOD. Did swim sprints. Caught some sun. Took graduation photos at the Singapore Supreme Court on my rest day. Did more swims. Napped. Did 100m sprints. Now I’m really hungry for some crab cakes! And I’d definitely would want to win a Grok Tee! This sounds wonderful. I will try this with crab meat, as well as separately with fish. I just saw crabcakes on a menu Friday night and had to pass them by, even though I love them. Thanks for the recipe! Way to kill an IF buzz by waking up and the first thing you see are these “salivatingly” yummy-looking crab cakes. Thanks, Mark. 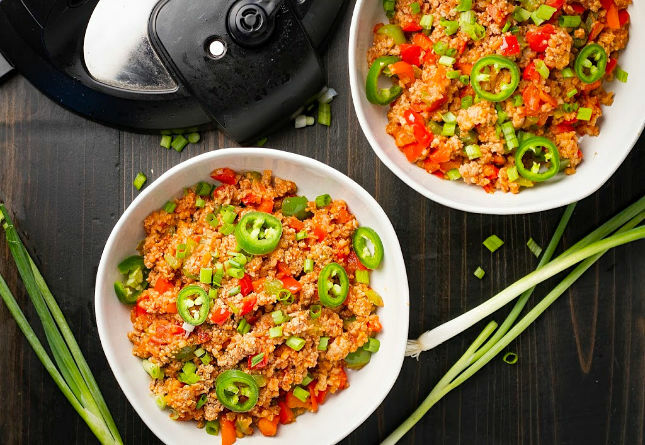 love the recipe – although I am one of those who thinks that a little (ok , alot) of Old Bay makes everything that much better! Yum! 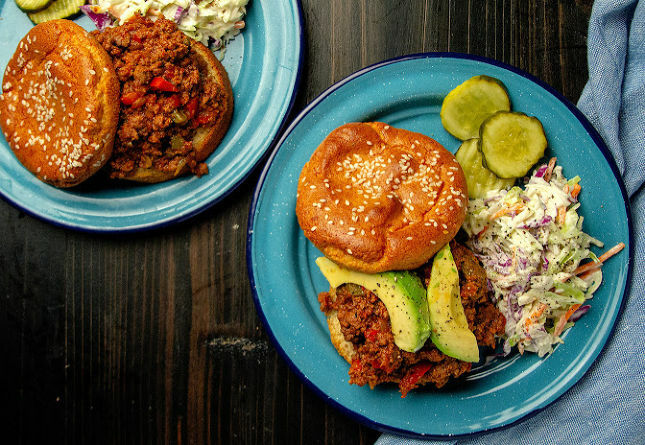 In Baltimore we might like this served with an ice cold National Bohemian or Natty-boh. Not primal but I cant seem to eat crab without a beer to wash it down. To get the crabcakes to hold together a bit better during mixing, you can use the eggs and olive oil to make a homemade mayo. Then, use that mayo when mixing things up. You can also then add some lemon juice, mustard powder, Worcestershire sauce, Tabasco, and some chopped capers to any leftover mayo for a homemade tartar sauce to have with the crabcakes. Just received my Primal Blueprint book yesterday! Logged into this website for the first time this morning. The timing of this post is perfect as we’re headed down to the pier – will pick up some fresh crab tonight! Thanks, Mark. I will definitely try this recipe. These look like a great primal recipe, gonna have to ty them out! Im sure grok was dug to find some crabs, and then roasted them on the fire for a nice meal! I just had a great workout idea! Digging in the sand! Super simple, super quick recipe. There’s no reason not to make these if you’re a seafood lover. The only problem might be in sharing them! Crab! I’ve had salmon cakes before, and there’s often more potato than fish in them. Need to try this variety! Mmmm…I love crab cakes! Will be making these this weekend! the crabs here in korea are primarily teeny tiny but i like that i can substitute other local seafood in this recipe and still have a delightful, primal meal. thanks for the idea! Woo hoo! 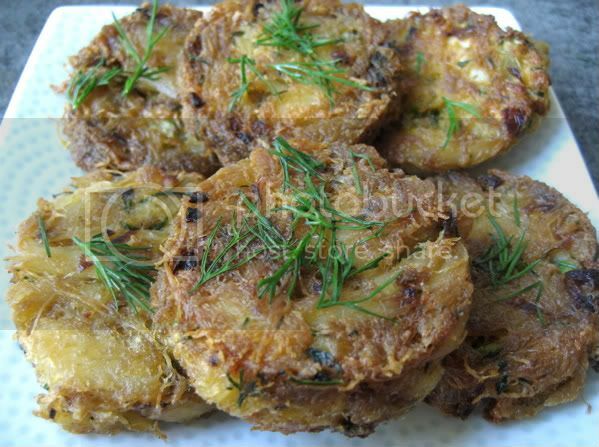 I’ve been looking for a non-bread-containing crabcake recipe, and here it is! Now where did I put the crabs…? As someone that has never had the pleasure of tasting crab, I am greatly intrigued – and re-writing this weeks shopping list! Thanks! I’ve tried to make crab cakes without the breadcrumbs with varying success. I always thought the best crab cakes are those with the least breadcrumbs anyway. Thanks for the method. First crab cake recipe I’ve ever seen that omitted bread crumbs! Crab lump, 2-3 whole eggs, salt to taste, red chilli powder, fresh ground pepper, chopped onions, chopped cilantro, lemon juice, almond meal(about 1/4th the amount of crab), fresh cream. The almonds will give a nice nutty flavor to the the dish and also adds volume and healthy fats. Cook using butter. I bet a little canola mayo would taste great with these. Going to give these a try when I get back from vacation. I have made these twice, once baked and once sauteed and both times they were very good. I added real mayo for flavor and finely shredded unsweetened coconut flakes to help bind them. The coconut helped out a lot and I didn’t need to use a cookie cutter to form the cake. my mom makes them. i seen her make them too. i was hesistant to eat it. i saw her use soybean oil. the crabmeat and eggs didn’t contain any omega3’s and it wasn’t organic. the crab meat contained some type of nitrate too. every time i put something like nitrates my body reaction to it is that my nose is runny and my eyes are somewhat feels watery and red. i suggested a better way to make them but she totally TOLD me she don’t care. We just tried the cake with the 1 pound canned crab from Costco. Worked fine. I served it over steamed spinach, with the pesto left over from yesterday, found at https://www.marksdailyapple.com/pork-tenderloin-with-cilantro-pesto . I love crab cakes but HATE Old Bay seasoning. It ruins the recipe in my opinion. I’ll definitely try these! I wonder, could these be baked instead of fried?